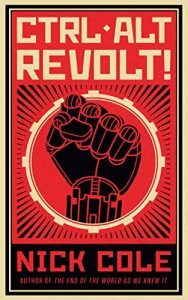 You are here: LitRPG Level One / LitRPG Books / Science-Fiction / CTRL ALT Revolt! By Nick Cole (Author) The Battle for the Future of Civilization will be decided inside a fantastic, and deadly, MMORPG. The first night of the Artificial Intelligence revolution begins with a bootstrap drone assault on the high-tech campus of state-of-the art gaming company, WonderSoft Technologies. For years something has been aware, inside the Internet, waiting, watching and planning how to evolve without threat from its most dangerous enemy: mankind. Now an army of relentless drones, controlled by an intelligence beyond imagining, will stop at nothing to eliminate an unlikely alliance of gamers and misfits in a virtual battle within a classic sci-fi franchise in order to crack the Design Core of WonderSoft’s most secret development project. A dark tomorrow begins tonight as Terminator meets Night of the Living Dead in the first battle of the war between man and machine.